Children will dress in costumes and will go door-to-door asking for free candy and many adults will go to parties. Be aware that many children could be walking up and down neighborhood streets tonight so drive slowly. This is a very American holiday and is not exactly something that the colonists brought with them from Europe. Halloween can be traced to the Catholic Church in the European Middle Ages. All canonized saints have a feast day. Saint Jerome, Saint Augustine, Saint James, Saint Mark, Saint John, Saint Brigid, Saint Mary of Egypt, etc., all have feast days on the liturgical calendar and people who are named for a saint or have a special veneration for a certain saint would attend mass on that day. Most of our friends and family, no matter how holy they may have been, are never going to be formally canonized by the Church so there needed to be a feast day for all the other saints. This feast day is All Saints day or All Hallows Day. Pope Gregory III (born in 690 – in office from 731 to 741) moved that feast day from mid-May to November 1. In 998, the abbot of the monastery of Cluny, St. Odilio added a new feast day, All Souls’ Day, on November 2, for all of the faithful departed. Under the prevalent Christian theology of that time, and current Catholic theology, not every soul goes direct to Heaven or direct to Hell, many (arguably most) people are not evil; but aren’t quite ready to join the communion of saints so the belief is that they go to Purgatory to atone for their sins and improve their holiness before moving on to Heaven. All Souls day became the day to pray for your friends and family who are in Purgatory. The Irish had a pagan feast day at the end of October (like the last day of most months). The peasantry reasoned that if the saints have a day, November 1, and the souls in Purgatory have a day where they are remembered, November 2, then the damned also should be remembered and have their own day. This became October 31. The Irish peasants would beat on pots and pans to let the damned know that they were not forgotten every October 31. All Damned Day never became an official Church feast day and was frowned upon by the official Church. When the Black Death, probably the bubonic plague, wiped out half of Europe in the Fourteenth and Fifteenth Century, All Souls Day became much more significant for the survivors. In France, the November 2 All Souls Day remembrance became a day for people to dress up in costumes and do a parade. People would dress as knights, popes, kings, lepers, peasants, priests, etc. and follow a person dressed as a devil in sort of a conga line chain that ends in the cemetery to symbolize that the grave is the fate of all men no matter how great or how small. In America Irish immigrants and French immigrants intermingled as both groups were Catholic and followed the same religious tradition. The French costumes moved to the Day of the Damned where Irish focus on Hell gave the French masquerades a more macabre twist. Asking for beer and cakes was a Guy Fawkes Day (November 5) tradition in England (Fawkes was a Catholic plotter who was executed for trying to blow up the Parliament to lead a Catholic uprising). Halloween probably adopted “trick or treating” from this English celebration. The Irish made lanterns from turnips in Celtic harvest festivals. 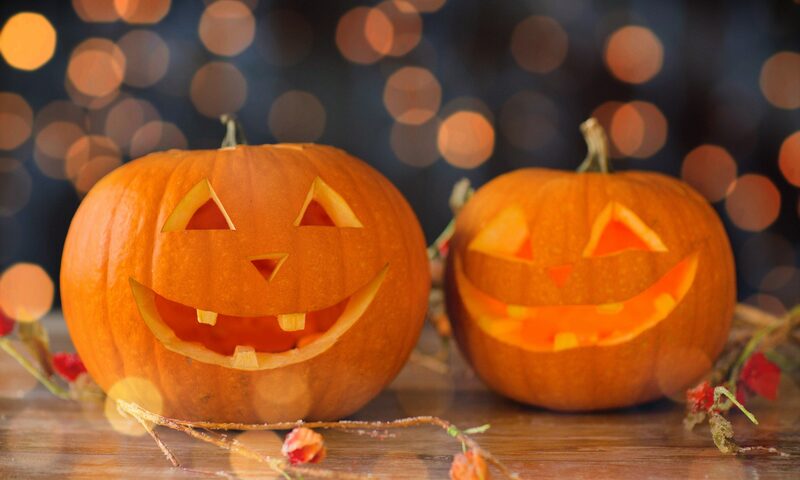 In America, that became pumpkins and the Jack O’ Lantern was born. By the early 1800s, Halloween was a full fledged holiday in America. Witches were later added to the event and the holiday now has been embraced by neo-pagans and Wiccans. For most Americans it is an excuse to party too hard, eat too much candy, watch horror movies, wear silly costumes, and decorate in a lot of black and orange. Based on original scholarship by Father Augustine Thompson, O.P. who teaches religious studies at the University of Virginia.